If you’re looking for a subcompact SUV with great off-road capabilities and a distinct personality, then the Jeep Renegade is definitely for you. Four trim levels help the renegade conform to different purposes. The Trailhawk trim level for example, is built to offer optimized off-road capability. The Renegade follows similar trends as other traditional Jeep vehicles in terms of durability and rugged styling, but also carves out a niche with its own unique flair. The Jeep Renegade can come equipped with one of two available engines. The starting option is the turbocharged 1.4-liter four-cylinder engine which is capable of generating 160 horsepower and 184 pound-feet of torque. If you’re looking for a little more energy, the 2.4-liter four-cylinder engine is an appealing alternative offering 180 horsepower and 175 pound-feet of torque. This engine is standard on the two highest trim levels, the Limited and the Trailhawk, but is available on all other trims as an optional feature. Both of the engines are paired with a unique transmission. The 1.4-liter is completed by the six-speed manual transmission, whereas the 2.4-liter engine comes paired with a nine-speed automatic transmission. The Trailhawk trim level is one of the many impressive options. It is designed to offer improved performance in off-road conditions and comes with special features and equipment to help achieve this goal. It comes standard with all-wheel drive and offers augmented abilities like 8.1-inches of wheel articulation, water-fording capabilities of up to 19-inches, and 8.7-inches of ground clearance. Other trim levels offer different capabilities and come standard with front-wheel drive, although all-wheel drive is available on all trim levels. The front MacPherson strut suspension with a stabilizer bar, high-strength steel double shell lower control arms, flat front steel cross-member, coil springs and high-strength steel mono-shell lower control arms and the rear Chapman strut suspension with an isolated steel rear cradle, a stabilizer bar, coil springs, and high-strength steel links come together to offer a smooth and safe ride in even the most treacherous environments. The Jeep Renegade stays true to Jeep tradition, incorporating many of Jeeps signature style elements while also cultivating its own personality and sense of identity. At the base-level trim, some of the standard equipment includes a height-adjustable driver seat, a four-speaker sound system, cloth upholstery, keyless entry, 16-inch wheels and push-button start. Sport level packages include the Sport Appearance package and the Power group. Can I see your current stock of new vehicles online? How Many trim levels does the Jeep Renegade come in? The Jeep Renegade can come in one of four trim levels: Sport, Latitude, Limited, and Trailhawk. 70 available safety features help to protect both the Jeep Renegade and its passengers. The standard equipment includes hill-start assist, traction and stability control, antilock brakes, and a variety of airbags, including front side and driver’s knee. There is a large number of advanced safety features that offer augmented protection in specific areas. Lane departure warning and mitigation, rear cross-traffic alert, forward collision mitigation, and automatic emergency braking are all available advanced safety features. Some Renegade models come standard with a rear backup camera which is particularly nice when parking in urban environments or in situations when it’s difficult to see. 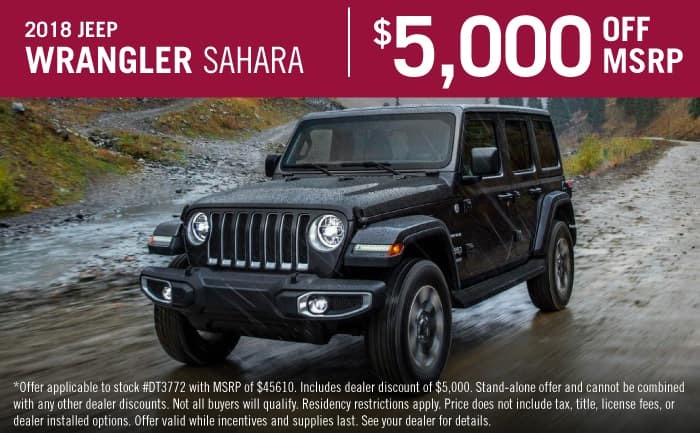 Stop by Texan Dodge Chrysler Jeep RAM and take one for a test drive today!